I finally started organizing the various git commands and aliases I use alot, and published them to github. My gitconfig repo. Some of these are useful only for projects similar to mine (fedora, tito based, bugzilla, etc) but I think some of then are generally useful. slog = "!sh -c 'git log --no-merges $1 `ls | grep -v ^po`' -"
brage = "!sh -c 'for C in $(git for-each-ref --sort=committerdate refs/heads --format=\"%(refname:short)\") ; do git show -s pretty=format:\"%Cgreen%ci %Cblue%cr%Creset $C\" \"$C\" -- ; done'"
tagage = "!sh -c 'git for-each-ref --sort=taggerdate refs/tags --format=\"%(refname:short)\"'"
brlog = "!sh -c 'for C in $(git for-each-ref --sort=committerdate refs/heads --format=\"%(refname:short)\") ; do git show -s --pretty=format:\"%Cgreen%ci %Cblue%cr%Creset $C\" \"$C\" -- ; git show -s $C ; echo; done'"
buggyfiles = ! "git log --format=\"format:%n\" --grep \"^[[:digit:]]\\+:\" --name-only | grep . | sort | uniq -c | sort -n"
Near space balloon launch talk at TriLug. 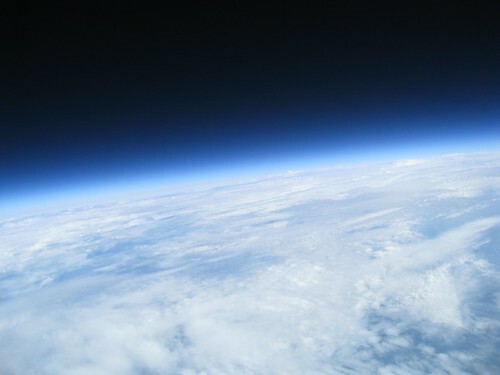 Since several TriLUG’ers were involved, TriLUG is hosting a talk about our recent balloon launch. The talk will be given by Tanner Lovelace and Jonathan Trappe. The meeting will be Thursday, Sept 9, 2010 at Red Hat headquarters in Raleigh, NC. 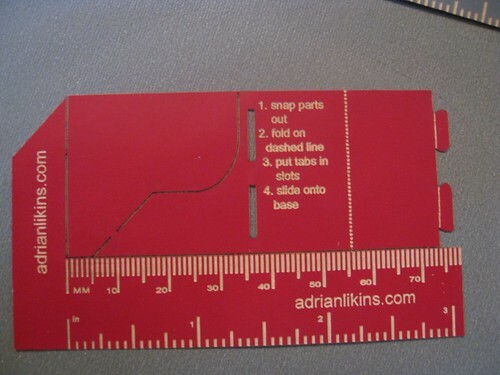 This is a project I’ve been experimenting with at Techshop Durham. 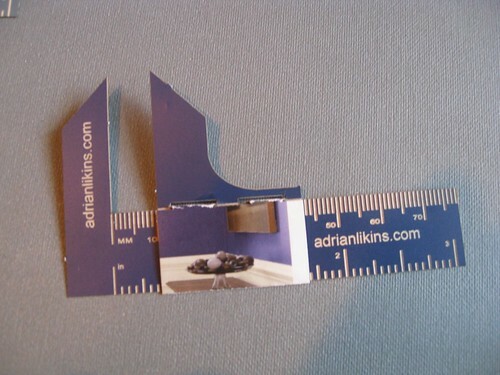 It is a laser cut business card that folds up to create a working caliper. I’ll probably make some for myself, Rod-o-Rama, and lintqueen. 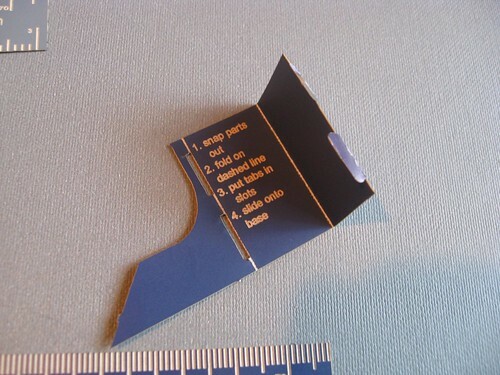 Card assembled, ready to use. 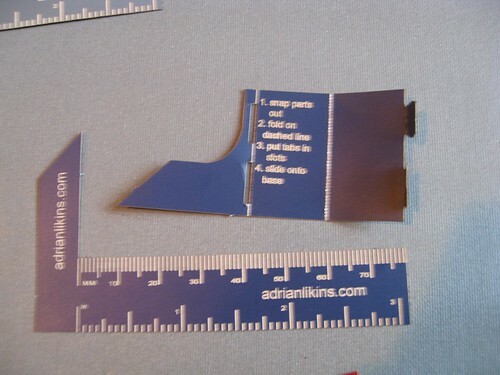 These particular examples were actually cut out of paint chip cards (lintqueen’s idea). 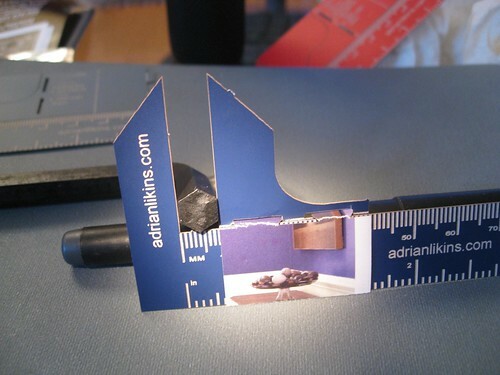 In action, measuring an 8mm hex key. 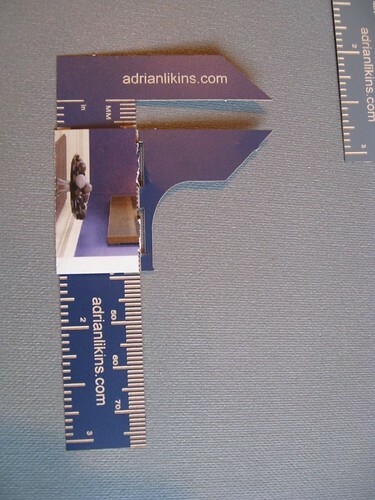 Accuracy and precision are not too bad for something folded out of paper. It’s cut and engraved with the epilog laser cutter at Techshop Durham. Initial design scratched out on paper, transferred to Inkscape, final tweaking in Corel Draw (actualy, lots of tweaking, since it did a horrible job importing the svg). It still needs some refinements, like better instructions and possibly an illustration or two. I have some minor aesthetic tweaks in mind as well, but this version is mostly complete. The corel draw source file is here. That file could use some cleanup, and I’d like to get it back into a open format like svg, but that will do for now. Consider it under Creative Commons. 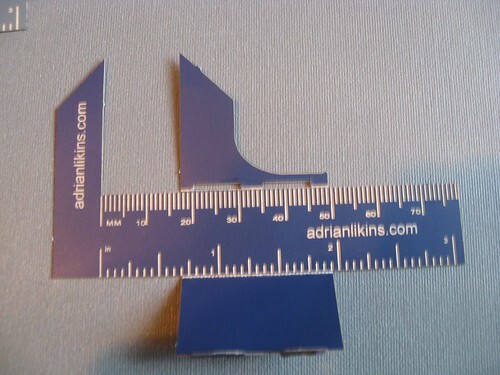 Business Card Caliper by Adrian Likins is licensed under a Creative Commons Attribution 3.0 United States License. Based on a work at www.adrianlikins.com. Things that cause tech guilt. – I should backup more often. – I should use any/stronger crypto on everything. – I should write this code using WhizBangTech instead of the way that works and I actually know. – I should document this. – I should file a bug report about this. – I really should refactor this code. I managed to get one of my machines installed with a os version I didn’t want, and no way to change it. Normally, this means it’s time to koan/cobbler to get it re-provisioned. But I couldn’t log into the machine to do anything. I could of reinstalled it from a cd/dvd, but I hate burning cd/dvd’s for that. I could of written an image to usb key and installed from that, but I didn’t have any with me. So I decided to try what Mark Cox; did and try to boot it from my phone. I more or less just followed the steps he mentioned, though I had to get some 3rd party software to expose the storage card as a usb device. But that aside, it worked. Not the fastest way to boot, but it got the live image running so I could do a hard drive install. Kind of cool. Wonder if there is anyway to support i386/x86_64 live images on the same card? Video put together by Red Hat in which Seth Vidal, Michael DeHaan and I comment intelligently about func. Or at least, that’s what the clever editing will hopefully lead you to believe. Spent most of Sunday trying to learn how to use Blender (Blender the 3d modelling app, not the home appliance. I’ve already gotten my KACBO [Kitchen Aid Certified Blender Operator certification]). I knew it was a fairly impressive app, just from seeing what the kids did at the Red Hat High blender course a few years ago. It’s not the easiest thing to learn how to use, especially since I haven’t really tried any 3d apps in about 10 years. The last time I tried it, it was all CSG based apps for building models for POV-RAY. Blender is mostly a mesh based modelling tool, like most modern 3d apps. The main motivation being a combination of sites that offer web based 3d printing like shapeways.com and the possibility of Techshop Durham getting a 3d printer in the future. I only made it through a couple of the tutorials so far, but it’s been fun. Just need to figure out something cool to design and print. I posted a small script I use to help manage the git repo’s of func to github. It’s named gum. The basic idea is you include a gum.conf config file in your repo, that defines where you can find all of the repo’s and branches of the project in question. It’s got a couple of commands to add list the repo’s, add a repo, or add all of the repo’s. It always names the branch in the form remotename-branchname. I wrote it since it seemed I would end up with a different version of the git repo on every machine I used, and I got tired of tracking down remote and branch names to add them to each src checkout I was using.